“This host does not have any virtual machine networks, or you don’t have the permission to access them. 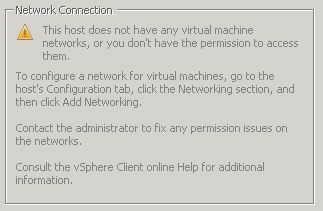 To configure a network for virtual machines, go to the host’s Configuration tab, click the Networking section,…“? But did you assign the permission to the switch itself, too? Open: Home – Inventory – Networking and assign the permissions to the Network Label. Thanks – stupid VMware KB missing the last step. Idiots. Lifesaver man!